SAN FRANCISCO: Uber and Mothers Against Drunk Driving want partiers to consider ride sharing as a safe alternative to driving home on Super Bowl Sunday. Uber will donate $1 to MADD for every trip taken this Sunday between 3 pm and midnight when users enter the promo code ThinkandRide. Super Bowl Sunday is one of the deadliest days for drunk driving annually, noted Amy George, MADD SVP of marketing and communications. In 2012, 47 people were killed as a result of drunk-driving-related accidents, compared with 28 people on an average day in the US. "People know what jersey they are going to wear, or what appetizers they are going to have at a party, but now we want to make sure people are putting a designated driver on that checklist and Uber is a great option," George said. "With all the options available at people’s fingertips today – such as ride sharing -- there is no longer an excuse to drive drunk." The in-house comms teams of Uber and MADD have targeted drivers with the campaign on their respective social media pages, including Facebook, Twitter, and Instagram, with the hashtag #ThinkAndRide. When you #ThinkAndRide, you save lives. See how safe, reliable rides have reduced alcohol-related crashes with the link in our profile. Post by Mothers Against Drunk Driving (MADD). Uber SVP of policy and strategy David Plouffe sent an email to all riders and drivers in the company’s database with the Super Bowl promo code. The joint initiative follows months of reputational challenges for the San Francisco-based ride-hailing service. Uber faced widespread criticism in November after an executive suggested researching the personal lives of critical journalists. It is also dealing with dozens of lawsuits around the country accusing it of incidences including wrongful death, regulatory complaints, and withheld tips, as well as challenges from taxi drivers and unions in various cities and states. Uber and MADD also released a joint report on Tuesday called More Options. Shifting Mindsets. Driving Better Choices, which claims the company is responsible for preventing nearly 1,800 crashes in California since July 2012. Drunk-driving crashes fell 6.5% among drivers under age 30 in the markets where Uber operates following the launch of uberX in the state, according to the study. This equals 60 fewer drunk-driving crashes per month. The report also included a Benenson Strategy Group survey of attitudes about ridesharing services and their role combating drunk driving. Seventy-eight percent of respondents said friends are less likely to drive home after drinking since ridesharing services such as Uber started operating in their city. It also found 93% would recommend Uber as a safer way home to a friend who had been drinking. MADD and Uber also held a joint press conference on Tuesday morning to discuss the study’s findings and blogged about the data on their respective websites. Both the study and campaign are part of the two organizations’ broader efforts to raise awareness and reduce drunk driving locally and nationally, which have been ongoing since July 2014. "We both have a goal of making our roads safer for everyone," said Lane Kasselman, Uber’s head of communications for North America. "We know alcohol-related crashes can be avoided, and one way is by taking a safe ride home, whether that is via a designated driver or ride sharing." 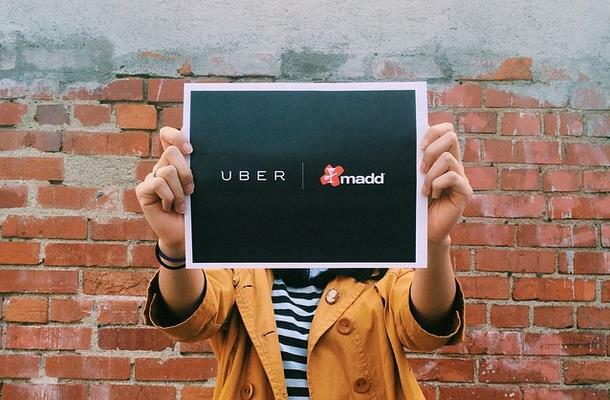 Uber and MADD will meet next month to discuss potential future partnerships. George suggested an initiative for St. Patrick’s Day, the second-deadliest day for drunk-driving accidents in the US, may be in the cards. "Looking at partnerships that can increase our reach and awareness about this issue and take the concept of designated drivers to the next level, we felt that a relationship with a rideshare service like Uber was a natural progression and fit," she added. Meanwhile, rival ride-hailing service Lyft began buffing its image this week. It said the fuzzy mustaches that drivers place on the front of their cars were being traded in for "glowstaches" – plastic glowing mustaches – that will be attached to drivers’ dashboards with magnets. Lyft also rolled out a refurbished app, new color palette, and partnerships with eHealth, AutoNation, and Intuit to help drivers find health insurance, file their taxes, and buy cars that meet the company’s standards. Your call: Did Uber's apology go far enough?